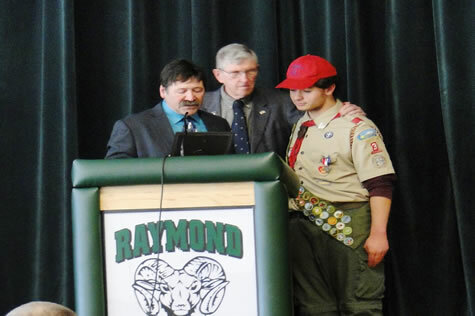 Family, friends, supporters and Scouts filled the Raymond High School cafeteria for Anthony Dickerson's Eagle Court of Honor on Saturday, Feb. 27. Anthony, a member of Raymond Troop 3, is home schooled and in the 11th grade. He started as a Cub Scout in Cub Scout Pack 144 in Manchester, Conn., then joined Cub Scout Pack 100 in Raymond in 2006 and went on to Raymond Scout Troop 100 from 2009-2010. In 2011 he helped found Raymond Scout Troop 3 and in 2015 joined Venture Crew 138 of Deerfield. His entire family is involved in Scouting - as his grandmother Jane Bailey put it, "We are a Scouting family." Both his mother, June Dickerson, and his father, Doug Dickerson, are involved with Troop 3. 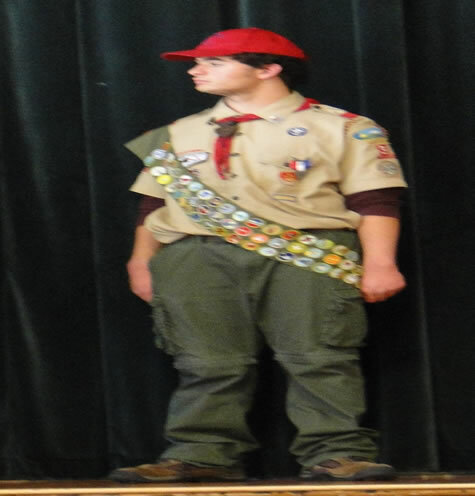 Anthony has attained far in excess of the required number of merit badges during his Scouting journey, holding 77 in all. He has held numerous leadership positions during his Scout journey, including Senior Patrol Leader, Den Chief, Historian, Patrol Leader, Assistant Patrol Leader and Librarian. Anthony Dickerson's sash displays over 70 Merit badges . Troop 3 Scoutmaster Jonathan McCosh Sr. was the Eagle Court of Honor Master of Ceremonies, and as Anthony said during his speech, "he is the best." Anthony received a lengthy number of presentations from local officials, state officials and Legislative bodies during the Court of Honor. Anthony Dickerson along side his Scout Master Jonathan McCosh. 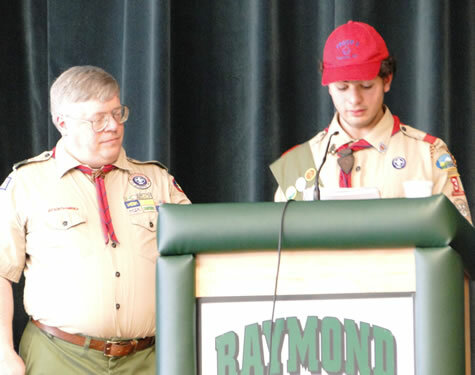 Eagle Scout Ryan Zahler gave Anthony the Eagle Charge and Anthony's Eagle Coach, Mike Kappler, gave him his badge. State Senator John Reagan and State Representative Carolyn Matthews, R-Raymond made presentations, as did Raymond Selectmen Greg Bemis and Jack Barnes. Dickerson with State Representatives Carolyn Matthews and Mike Kappler. Dickerson with Selectmen Greg Bemis and Jack Barnes. 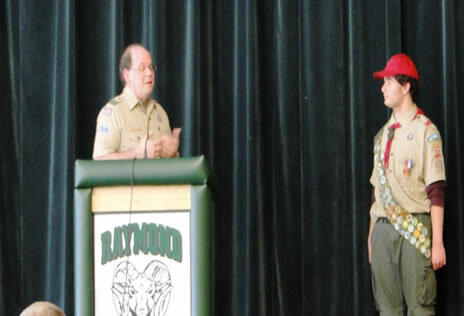 Marc Zahler, former Troop 100 Scoutmaster, recalled Scout-related experiences with Anthony, and Anthony’s fellow members of Troop 3 presented the new Eagle Scout with his Eagle neckerchief. In his speech Anthony urged young scouts to pay attention to and appreciate their leaders because someday they will be in that role. Dickerson's Eagle Court of Honor with Marc Zahler. 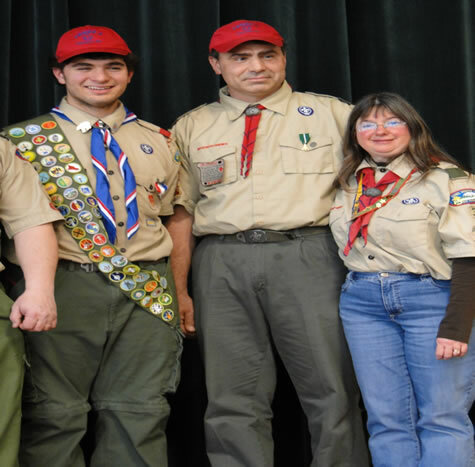 "My participation in Troop 3 has been the single most rewarding part of my scouting experience," Anthony said. 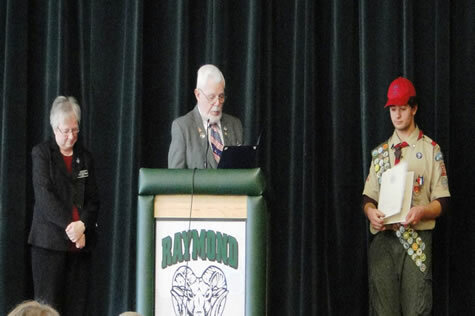 He noted that the best part has been working with the younger scouts and added, "Scouting has been the most rewarding and fun part of my life and I have no intention of stopping." 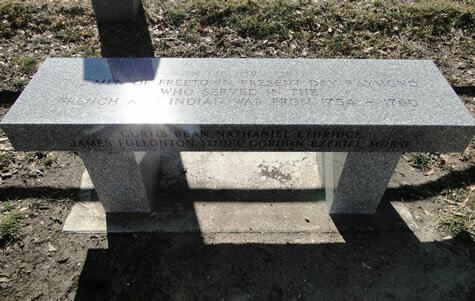 For his Eagle project Anthony researched and designed a granite bench located on the Town Common and erected in memory of the French and Indian War veterans of Raymond. Raymond at the time was known as Freetown and was a part of Chester. The French and Indian War was fought from 1754-60 and with his interest in history, Anthony learned that some residents had been participants but had never been recognized, and he wanted to rectify that. Anthony said he had to do a great deal of research to determine the identity of the veterans and went to the Raymond and Chester libraries, the New Hampshire State Library and the Historical Research Library in Concord to cross check and determine the veterans’ names. Anthony, along with a band of volunteers, poured a concrete slab at the Town Common in November 2014 for the bench to sit upon. Anthony raised the money for his project with fund raisers but received donations as well. He held one pot roast dinner with a book sale in the winter of 2015 and two sandwich lunches with book sales. Seacoast Memorials in Brentwood built the bench, which was placed on the Raymond Town Common in August 2015. Anthony said McCosh and Kappler were big helps in his project, and his scout buddies from Raymond Troops 3 and 100 and Hampton Troop 136, as well as family and friends, helped him with his project, which took more than 500 hours to complete. Following the formal Eagle Court of Honor ceremonies, the attendees were treated to a Chinese feast. Dickerson after his Eagle Court of Honor ceremony.